Development of a proposal for pharmacist prescribing stretches back to 2010 when the College Board first decided to move forward with a feasibility study. 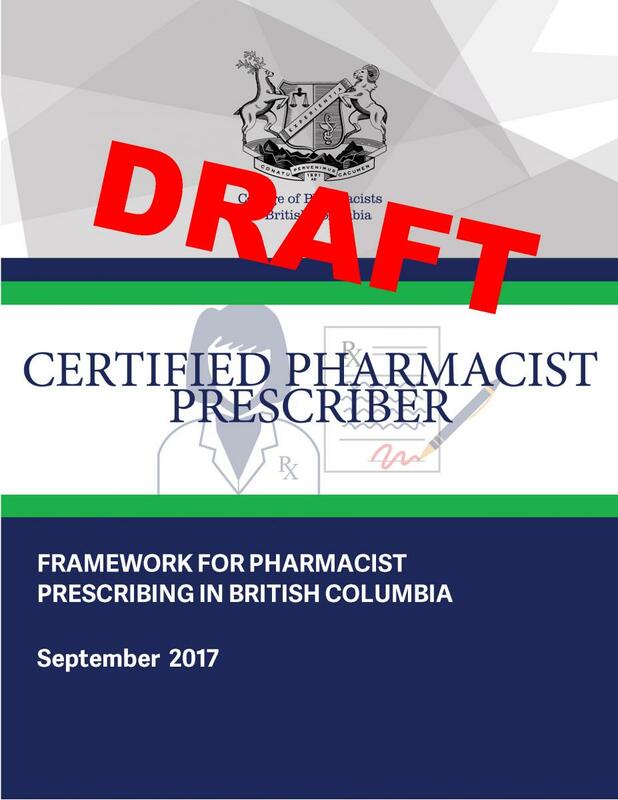 An initial Certified Pharmacist Prescriber Draft Framework was developed in 2015 and used to help facilitate stakeholder engagement in 2016. Input from patients, pharmacists and other prescribers was used to develop the new Framework for Pharmacist Prescribing in BC which focuses more closely on collaborative practice. Engagement in 2017 showed increased confidence in pharmacist prescribing from all stakeholder groups. In November 2017, the College Board approved the submission of a proposal for pharmacist prescribing in BC to the Minister of Health, requesting amendments to the Pharmacists Regulation under the Health Professions Act. 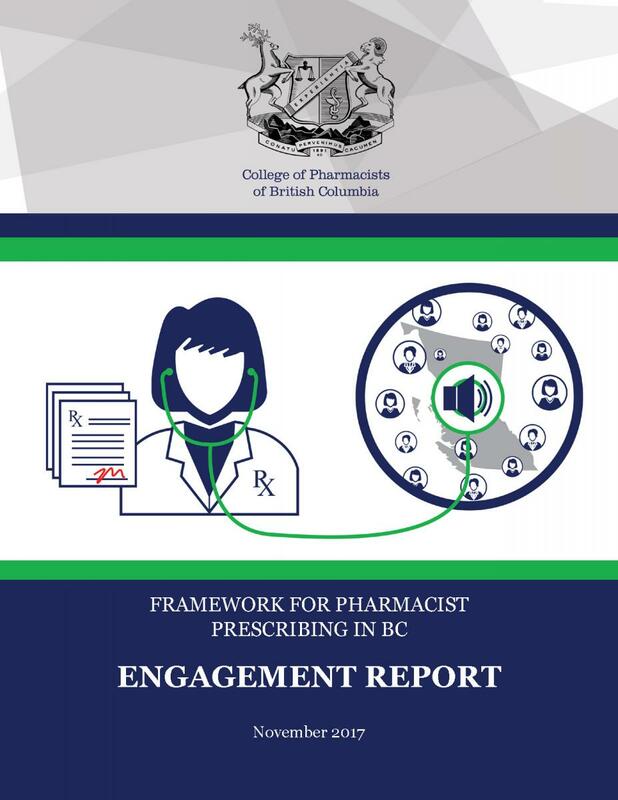 The submission will include the final Framework for Pharmacist Prescribing in BC and the Engagement Report. The online consultation ran from September 21 through to October 8, 2017 and sought feedback from registered pharmacy professionals, patients and other health professionals. The College also hosted 3 live engagement sessions with patients and pharmacy professionals. Live engagement sessions included a Pharmacist Prescribing Patient Session on September 21, 2017, as well as sessions with the College’s Advisory Committees, Canadian Society of Hospital Pharmacists BC Branch and Health Authority Pharmacy Directors. The purpose of this engagement was to give patients, pharmacy professionals and other health professionals an opportunity to provide their input and share their thoughts on how pharmacist prescribing in collaborative practice relationships could work to help care for patients in BC. The College reached out to patients, pharmacy professionals, pharmacy students and other health professionals as part of the engagement on pharmacist prescribing. Like the initial engagement in 2016, the College continued to receive significant participation during the second engagement on pharmacist prescribing. The College would like to thank everyone who provided feedback during the consultation period, as well as those who helped build awareness of the opportunity to provide input. The College also reached an estimated 58,000 through its Facebook channel and received over 470 reactions (with more than 90% positive reactions including likes and loves). The College also reached over 5,800 on Instagram and over 2,800 on twitter. Over 1,120 completed the online survey providing over 10,364 comments to a range of questions on pharmacist prescribing. While the majority of responses came from registered pharmacists (54%), the College received many responses from both members of the public (14%) and other health professionals (11%). Pharmacy students also made significant contributions to the survey (15%). Overall, most stakeholder groups had confidence in pharmacist prescribing in BC. Feedback indicated strong support for implementing pharmacist prescribing to help care for patients from pharmacists, pharmacy technicians, pharmacy students and members of the public. Physicians illustrated strong resistance, while others (such as nurses and nurse practitioners) indicated support for pharmacist prescribing. This pattern was apparent across the four key themes of confidence in pharmacists prescribing, collaboration, improving patient care, and support for pharmacist prescribing. The greatest convergence across stakeholder groups surrounded the opportunities for greater collaboration in caring for patients as well as the ability to help protect patient safety and improve patient outcomes. In particular respondents noted that pharmacist prescribing would be beneficial for chronic disease management as well as minor ailments and prescription renewals and increased monitoring and management of drug therapy. The Framework for Pharmacist Prescribing in BC is focused on preventing patient harm by reducing preventable drug-related problems and providing safer transitions in care through increased involvement of pharmacists, as medication experts in the delivery of patient-centred collaborative care. Improving medication management and reducing preventable drug-related hospitalizations protects public safety and will improve patient outcomes. Pharmacist prescribing is proposed to take place through interdisciplinary team-based care where physicians and nurse practitioners would continue to be responsible for the diagnosis, and access to health records and diagnostics, including lab tests, would be facilitated. Certified Pharmacist Prescribers would also be restricted from dispensing medications they prescribed for a patient. The framework also focuses closely on the benefit to patient care and identifies specific opportunities to prevent patient harm and improve patient outcomes. Reduced risk factors for chronic disease, improved blood glucose, improved blood pressure, improved lipid levels, and reduced risk for major cardiovascular events are all examples of pharmacist prescribing in collaborative relationships preventing harm and improving patient outcomes in recent studies. These opportunities to improve patient outcomes and prevent patient harm through pharmacist prescribing cannot be ignored when considering patient safety. While the College does not advocate for changes to scope of practice for the advancement of the pharmacy profession, it does consider changes to pharmacy practice that are in the best interests of patients by increasing public safety and improving patient outcomes. Like the expansion of the pharmacists’ role in drug administration, the College is proposing regulation of Certified Pharmacist Prescribers to help pharmacists better care for their patients and protect them from preventable drug related problems. This is our second consultation on pharmacist prescribing. Our first consultation was conducted in 2016 using an initial draft framework. This online consultation provides the opportunity to provide input on the new Framework for Pharmacist Prescribing in BC which more closely focuses on collaborative practice. We are seeking input from patients, registered pharmacy professionals and other health professionals. This input will be used to help finalize the Framework Pharmacist Prescribing in BC. The feedback you provide will be summarized in an engagement report which will be shared with the College Board to aid in decision making as well as published on our website. This engagement is at the level of consult on the spectrum of engagement (based on IAP2 Participation Spectrum). This means we promise to listen to and acknowledge your ideas and concerns, and provide feedback on how your input affects the decision. The College completed its engagement on pharmacist prescribing in October 2016, including analyzing the extensive feedback received, and prepared a report on the results of the engagement. The report was shared with the College Board in November 2016 to aid in decision making on the next steps for pharmacist prescribing in BC. The consultation period ran from February 2016 to August 2016 and included 15 different workshops and stakeholder meetings with over 25 different groups and organizations as well as an online survey which received more than 11,400 comments from over 1,500 respondents.The College would like to thank everyone who contributed feedback during this engagement. Overall, stakeholder groups were quite divided in their level of confidence in pharmacists prescribing as well as their support for the initiative. Feedback indicated overwhelming support from pharmacists and pharmacy technicians, but strong resistance from other prescribers, while the public was divided. The greatest convergence across stakeholder groups surrounded the opportunity pharmacist prescribing could have in providing greater access to care, especially for minor ailments, emergency situations, continuity of care and for patients without a primary care provider. Feedback from pharmacists and other prescribers also highlighted that pharmacist prescribing might work best in interdisciplinary team-based settings where access to more patient information and lab test results, and having a physician or nurse practitioner available to provide a diagnosis, provided respondents with greater confidence in pharmacist prescribing. 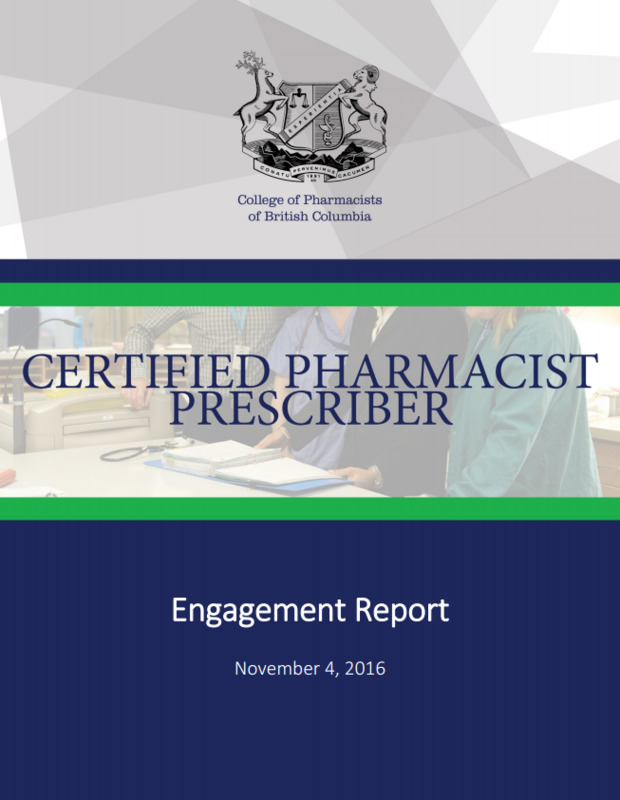 Learn more about the results of the 2016 engagement through the 2016 Certified Pharmacist Prescriber Engagement Report. After reviewing the results of the engagement, the College Board made the decision to amend the initial draft framework by narrowing the scope of pharmacist prescribing to within collaborative practice. Collaborative practice for pharmacist prescribing would involve interdisciplinary team-based care where physicians and nurse practitioners continue to be responsible for the diagnosis; and where access to health records and diagnostics, including lab tests, would also be required. It was also suggested that the College may want to look more closely at how the authority in Professional Practice Policy 58 to adapt prescriptions (including renewals) could help improve access to safe and effective drug therapy for patients. Pharmacy professionals, the public and other prescribers all highlighted some examples where pharmacist prescribing could have the opportunity to improve access to care for minor ailments, refills and renewals. However, significant concerns still remained around prescribing for minor ailments including access to electronic health records, access to and ordering of lab tests, and conflict of interest with prescribing and dispensing. See the presentation and College Board discussion on next steps for pharmacist prescribing through the BCPharmacy Periscope Channel. For the purpose of the framework, the College is requiring collaborative practice relationships. Separating pharmacist prescribing from dispensing and business interests removes the concern for a potential business conflict of interest – a frequent point of concern for respondents. Collaborative practice settings involve working closely in an interdisciplinary team to care for patients. In this setting, physicians or nurse practitioners provide the diagnosis – an area many other prescribers felt pharmacist prescribers would not have the expertise to practice in. Pharmacists working in collaborative practice settings already have access to patient health information and lab tests. Lack of access to patient information, and diagnostic tests (including lab tests) outside of interdisciplinary settings was a key point of concern identified by many pharmacists and other prescribers. Many pharmacy professionals have expressed the need for pharmacists to have clear access to order and review lab tests. This Draft Framework also identifies the need for pharmacist prescribers to access and order lab tests. While some access to lab tests may be already available through the “My ehealth” portal or patient charts, access, ordering and payment is not consistently available to support pharmacists in providing drug therapy. The College Board recognizes the need to address this issue. However, elements of lab tests, including ordering and payment, is outside of the College’s direct control and as a result involves additional complexity to resolve. As a result, the decision was made by the College Board to move forward with the Framework for Pharmacist Prescribing while recognizing the need to address issues with consistent access to lab tests. We also believe this Draft Framework, and the input we receive from registrants and other stakeholders, will help demonstrate the need for pharmacists to consistently have access to, and order and interpret lab tests. For this reason, scoping out the path towards ensuring all pharmacists can order and access lab tests is beyond the direct focus of this initiative. What does Pharmacist Prescribing look like? Assessment - All pharmacist prescribing includes an assessment of the patient and the condition by the pharmacist prescriber. The assessment involves considering many details including past medical history, social history, history of the present illness, medication history, mental health and more. The assessment may also include a physical assessment, or reviewing diagnostic information or laboratory values. 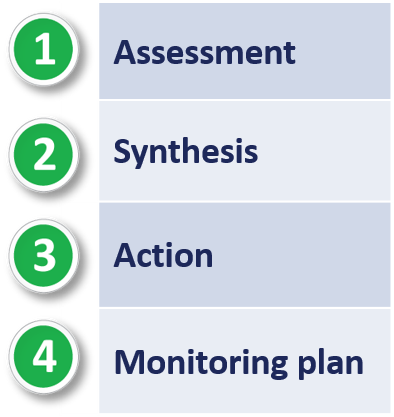 Synthesis - A synthesis, or conclusion, of the patient’s needs is reached by the pharmacist based on the assessment of the patient. This guides the prescribing decision. Action - Based on the pharmacist prescribers’ assessment and synthesis, they will make a prescribing decision. 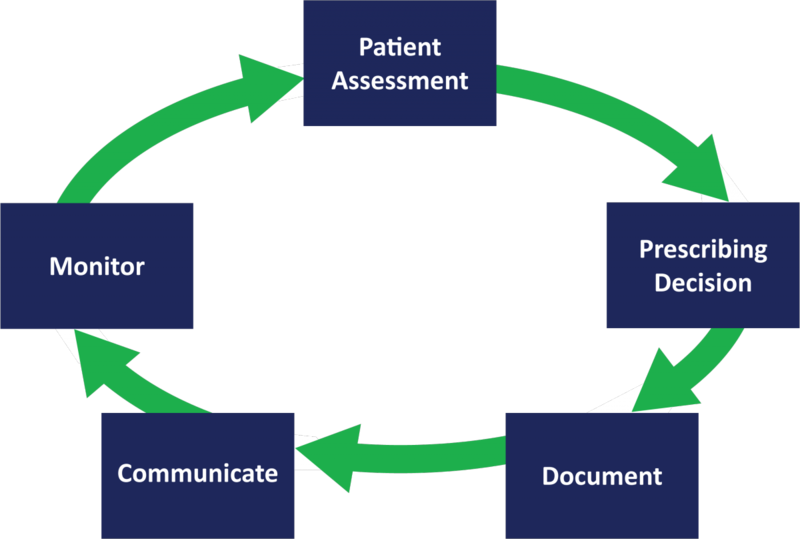 They document the prescribing decision and rationale, and collaborate and communicate with other members of the patient’s health care team as appropriate. Monitoring plan - All pharmacist prescribers must also develop a monitoring and follow-up plan. Examples of these can be found in the patient use cases. Not all prescribing decisions will necessarily result in prescribing a drug. After assessing a patient, a pharmacist prescriber may find it is appropriate to prescribe, to de-prescribe, or not to prescribe. They could also decide it is appropriate to consult with, or refer the patient to, other members of the health care team. For example, a pharmacist would refer a patient when their condition is outside of the pharmacist prescriber’s scope of expertise or when patient care needs to be escalated. Patients are cared for through the collaboration of many health care professionals. Pharmacist prescribing increases the collaboration among the health care professionals in a patient’s care team. While a pharmacist prescriber is solely accountable for their prescribing decision, pharmacist prescribing still requires collaboration with others involved in the patient’s care. The draft framework includes a range of use cases where pharmacist prescribing improves patient outcomes. They are all based on real cases. A Certified Pharmacist Prescriber with a collaborative practice relationship in a team-based primary care clinic helps manage a patient’s drug therapy for diabetes and cardiovascular disease. A 65-year-old male visits the primary care clinic for an initial patient assessment with a pharmacist prior to their seeing physician. He has a meet-and-greet appointment scheduled with his new general practitioner scheduled for 2 months away. Based on the assessment of the patient, the pharmacist prescriber determines that his glycemic control is not at target, his blood pressure is not at target, and his cardiovascular disease risk reduction therapy is inadequate. The pharmacist prescriber established a collaborative relationship with the patient’s family physician, established drug therapy goals together with the patient and physician to improve the patient’s glycemic control, and ensured information and updates could be effectively shared between the physician and the pharmacist prescriber. Monitoring and follow-ups are set up with the patient with ongoing updates provided to the family physician. A Certified Pharmacist Prescriber in a community pharmacy establishes a collaborative practice relationship with a patient’s GP. The care plan developed allows the Certified Pharmacist Prescriber to help optimize the patient’s blood pressure between visits to his GP every few months. A 40-year-old male visits a pharmacy to pick up his refills for anti-hypertensives. He shares with his pharmacist that he concerned that his home blood pressure readings have been gradually increasing and he is wondering if his current meds are working. His home blood pressure readings have been consistently higher than 140/90 recently. Based on the assessment, the pharmacist prescriber determines that the patient’s blood pressure is not at target, and that he has an increased risk of prediabetes and uncontrolled hypertension as a result of the patient’s increased wait which the he struggles to address through lifestyle changes. The pharmacist prescriber established a collaborative relationship with the patient’s family physician, established drug therapy goals together with the patient and physician to improve the patient’s blood pressure, and ensured information and updates could be effectively shared between the physician and the pharmacist prescriber. A Certified Pharmacist Prescriber in a team-based residential care facility with collaborative practice relationships with a patient’s primary care provider and others on the care team. Certified Pharmacist Prescriber helps optimize and address unnecessary drug therapy to reduce the risks associated with polypharmacy. A 92-year-old female is being assessed by a pharmacist in a residential care for regularly-scheduled 6-month medication review. She currently prescribed 9 different drugs. Based on the assessment of the patient, the pharmacist prescribers determines that she will benefit through having her drug therapy adjusted to decrease some drugs, discontinue another, and prescribe calcium to reduce her level of polypharmacy. The pharmacist prescriber is involved in a collaborative relationship with others on the patient's care in the team-based residential care facility. The pharmacist prescriber discusses the patients condition and risks related to pharmacy with others on the care tea, then develops a care plan an evidence-based care plan based on established drug therapy. Information and updates are shared between the physician, pharmacist prescriber and others on the care team. A Certified Pharmacist Prescriber with a collaborative practice relationship in a team-based community hospital practice helps prevent the interruption of essential chronic drugs during a hospital stay. A 35-year-old female is admitted overnight to a general surgery unit at a community hospital for cholecystectomy for recurrent cholecystitis. She is assessed by the clinical pharmacist in the morning. She is experiencing right upper quadrant abdominal pain, nausea and abdominal tenderness. The general surgery resident completed the admission orders, but did not perform any medication reconciliation (creating the most accurate list possible of all medications a patient is taking), and no orders are currently written for prior-to-admission medications. Prevents adverse event for the patient due to lack of indicated psychiatric medications. Prevents medication withdrawal symptoms (e.g., SSRI) for the patient. Provides a positive patient experience due to lack of interruption of chronic therapy, and minimization of discomfort form mandatory temporary smoking interruption. The surgical team is not interrupted to complete the medication reconciliation. A Certified Pharmacist Prescriber with a collaborative practice relationship in a team-based primary care clinic helps ensure appropriate drug therapy is initiated to ensure a safe and effective transition in care during discharge from hospital. A 72-year-old male, who had no-fixed-address, is discharged to a shelter. He was admitted 3 weeks ago due to a sudden lack of blood flow (i.e. ischemia) in his right arm and both legs. The primary care clinic pharmacist identifies him for a medication review due to his discharge 3 days go from hospital. He is out of meds and lost his discharge prescription. Prevents serious adverse effects or additional hospitalization from his conditions – he could have deteriorated quickly without the medication reconciliation and getting the meds he needs without delay after losing his discharge prescription his (due to CHF/fluids, embolic event etc). Provides timely access to care especially for marginalized patients without a fixed address. Opportunity to work with a marginalized patient’s social supports to coordinate supportive services to improve the patient’s outcome. A Certified Pharmacist Prescriber with a collaborative practice relationship in a team-based primary care clinic helps review and adjust drug therapy for the patient’s COPD. A 60-year-old male visits a primary care clinic pharmacist for general medication review. A 66-year-old female visits a primary care clinic, prompted by a cardiologist who recently diagnosed her with recent-onset atrial fibrillation. The cardiologist told her to talk to her primary care provider about starting anticoagulation therapy. She has no specific complaints (asymptomatic) and presents the report from the cardiologist which documents atrial fibrillation and advises her primary care provider to “start anticoagulation”. Based on the assessment of the patient, the pharmacist prescribers determines that she continues to have atrial fibrillation and is willing to take therapy for stroke prevention in atrial fibrillation (SPAF), would prefer therapy using new oral anticoagulants or direct oral anticoagulants (NOAC/DOAC) but is concerned about the cost since she does not have private coverage and PharmaCare does not cover it unless warfarin is unsuccessful. Provides timely initiation of treatment for Atrial Fibrillation Stroke Prevention – the patient receives care following the cardiologists visit without having to wait for a visit with their primary care provider. The patient receives education, therapy, support, and a follow-up plan from the pharmacist in the clinic – this makes the management of the drug therapy for AF Stroke Prevention more efficient for patient and the care team. Collaboration on providing care for the patient between the care team, including the cardiologist, primary care provider, pharmacist prescriber and community pharmacy, is increased.